More than 100 nurses, health professionals, and support staff, and all the services they provide across dozens of departments are being cut if we don’t stop it. Sudbury‘s hospitals have already been cut to the bone. 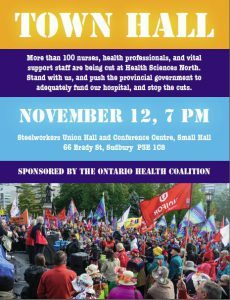 Please stand with us and push the provincial government to fund our hospital adequately and stop the cuts. Monday, November 12, 7 p.m.